My boring day at school seemed to drag on forever, until something super EXCITING and UNEXPECTED happened! You won’t BELIEVE what just happened! Meet us in the janitor’s closet ASAP! I rushed over to the janitor’s closet. The next thing I knew, Zoey grabbed me in and quickly closed the door. 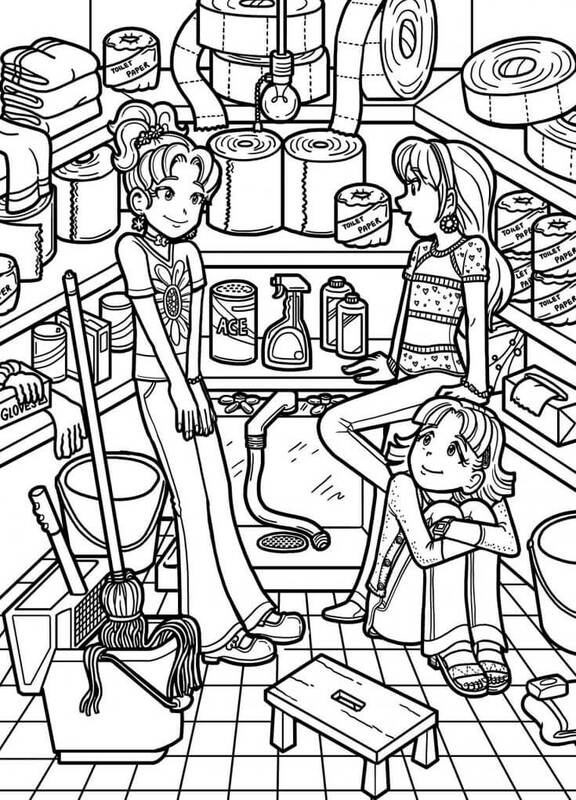 Why are Nikki and her BFFs in the janitor’s closet, and what exciting news does Chloe and Zoey have to share with her? Zoey was blushing like crazy! “Well I-” then Chloe inteupted Zoey and screamed “ZOE HAS A BOYFRIEND! ” I gasped. “We are super exited to tell you that me and Chloe got to know a secret about your locker ,”said Zoey. OMG !!!!!!!!!! Now I was getting super exited.I mean not that exited. “Should we tell her?”Asked Chloe. Then they made cute puppy like face. SOMETIMES I DONT FEEL LIKE THIER BFF I FEAL LIKE THIER BABY SITTER!!!! AND THEYV ARE CAN BE WORSE WAY MORE TERRIBLE THEN BRAINNA! WHY IS MY LIFE SO CURRDY? Zoey giggled and replied, “We both have a crush!!!! !” screamed Zoey. I stood there in shock! I couldn’t believe that Chloe and Zoey have a crush. “so who are you crushes! ?” I asked. “Well mine is….this boy named Josh…”Zoey said as she blushed “Mines….well….Andr’e” nervously said Chloey. “WHAT! ?” I couldn’t believe that Chloe had a crush on Andr’e. Zoey paused for a dramatic effect. Finally, she sighed and told Chloe to tell me. “We….. will have to wait and see,” Chloe said with a smirk. Once she said this, Zoey pulled my arm and led me outside of school. “What’s going on?” I asked, confused. Suddenly, Brandon arrived in a limo and said,” So are you coming in?” “WE PAID FOR YOU GUYS TO GO ON VACATION TO PARIS!! !” Zoey and Chloe screamed. I was so happy! I ran into the car and waved my BFFs goodbye. This was the best! “We are going to LA with Trevor Chase to make a reality TV show about our best selling novel series!” Knowing what it’s like to have my own TV show, I know it’s not very exiting. But being the good friend I am, I smiled and said, “That’s great Chloe and Zoey, but I’ll miss you so much! LA is so far away.” Chloe thought for a second and said, “Well, we can’t Face Time every day. I know! I’ll call Trevor Chase, and ask him if you can be on the show! You did draw the pictures anyways.” After calling him, Chloe smiled and said, “Good news! You can be on Behind the Scenes of Strawberry Princess!” We need to get me a plane ticket. The last time I rode on a plane was ruined because of Brianna. But this time, Brianna won’t even be coming with me, so it should be fine. We had to be in the media center all of bio, and most of lunch to get me a ticket to LA, but it worked! i can’t believe I’m finally going to LA. And with my BFFs too! But, for some reason, behind one of the book shelves, there was some lip gloss, and a purse. I recognized the teal purse with rhinestones, but I forget whose it was. A couple weeks later, we were at the airport, and just about ready to put our stuff in the boxes so that none of us were bringing illegal stuff on the plane. I know I wasn’t bringing anything illegal on there, but for some reason, I was wrong. the machine detected some metal in there. What? I didn’t bring any metal, did I? Rhinestones aren’t metal. I yanked it out and searched for what could be in there. What? A Taylor Swift CD? I don’t even like Taylor Swift! I saw MacKenzie on the other side of the tape thing. “Hahaha! You just got busted! Guess you won’t be going to LA to be on a dream TV show about a stupid book! I’m really sorry whoever did it to you! C’mon Jessica, I don’t want to be around a girl who lives in a pigstye anymore.” The people started to tell me to leave, and pulled me to the door. “Don’t worry, guys! I’ll Face Time you every single day!” Well, instead of going to Hollywood to be on a TV show with my BFFs riding in a limo with Trevor Chase, I’ll be stuck in Westchester, with my bratty little sister and annoying parents. At least I still have my diary. Zoey and Chloe stared at me I asked ” Chloe can you tell me?”. Then Chloe half yelled ” You Know Jesscia, well SHE WAS YOUR BFF AT YOUR OLD SCHOOL I FOUND OUT BECAUSE I HAVE A LOCKER NEXT TO HER’S” Oh crud that explained all the whispering and glaring at bio ” :(. After school I rushed home of course Daisy and Brianna tried to cheer me up. But I sat in my room having a pillow fight with myself it made me happy :)! I have to stop righting Mom’s calling me for dinner. WHY IS MY LIFE SO CRUDDY :(.